Hikers checking the map at a trail juncture. Opened in 1991, Cedar Hill State Park quickly became popular with campers, bicyclists, hikers and fishermen. This 1,826 acre park sits at the edge of Joe Pool Reservoir, a 7,500 acre man made lake. Two boat ramps with a total of ten lanes stay busy all summer with many of the visitors from the nearby city of Dallas, Texas. Boats are available for rental at the Joe Pool Marina. More than 300 developed (water & electricity, two dump stations) and 30 primitive walk-in campsites are offered for those folks escaping the city for the weekend or a week. The Dallas Off Road Bicycle Association (DORBA) has built and maintains 15 miles of challenging mountain biking trails here. The park was developed at the site of a 19th century family farm, the Penn Farm. A self-guided walking tour taking visitors through restored barns and buildings is an interesting and educational experience for families as they experience what life was like in this area before the tremendous growth of both Dallas and Fort Worth. 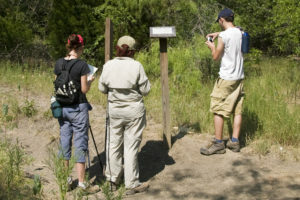 There are 4.5 miles of easy to walk pleasant hiking trails . An excellent guide to the Talala-Duck Pond Loop is available in the book ’60 Hikes within 60 Miles of Dallas/Fort Worth’ by Joanie Sanchez. The best thing about this park is the location. The proximity to both Dallas and Fort Worth allows city folks to enjoy time in the outdoors without a long drive. The worst thing about this park is also location. The closeness to two major cities does create crowds especially n the summer and on school breaks. This is a very clean park including well maintained restrooms. The campsites on the many upper loops are fairly large and generally level however if you prefer lakeside camping the sites are smaller, not so flat and better suited for tents or smaller travel trailers. This entry was posted in State Parks and tagged 60 Hikes within 60 Miles of Dallas/Fort Worth/Joanie Sa, Cedar Hill State Park, Dallas, Dallas Off Road Biking Association, DORBA, Family Farm, lakeside camping, lone star, metroplex, mountain biking, Penn Farm, Talala-Duck Pond Loop, texas, travelers. Bookmark the permalink.